Unique Downloadable Plans For The Woodworking Enthusiast! This is a woodworking project that you can easily build in a weekend. This solid wood top bookshelf night table may easily be finish to match your pre-existing bedroom furniture. Built from solid oak and oak veneer using simple joinery techniques, this piece of furniture will last for years to come. 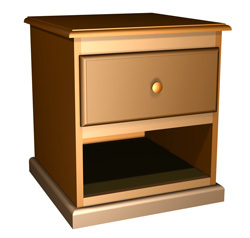 Of course, you may choose other wood species in order to match other furniture in the bedroom. The spacious, easy glide drawer is just perfect to store bedside knick knacks. In addition the bottom shelf can be use as a small library of your current readings. Finish used for this project: water-based Flecto Varathane Diamond Wood Finish, in a satin sheen. Overall dimensions: 18 1/4" deep by 21" high by 17 1/2"
Photos, exploded views, detailed drawings, optimize cutting diagrams, and a complete materials list. Download this plan in PDF now! You will need Adobe Acrobat Reader to view your plans. Click below to get your free copy. goods and services provided by Knotty Plans. Copyright 2003 - 2018 Knotty Plans, All Rights Reserved.